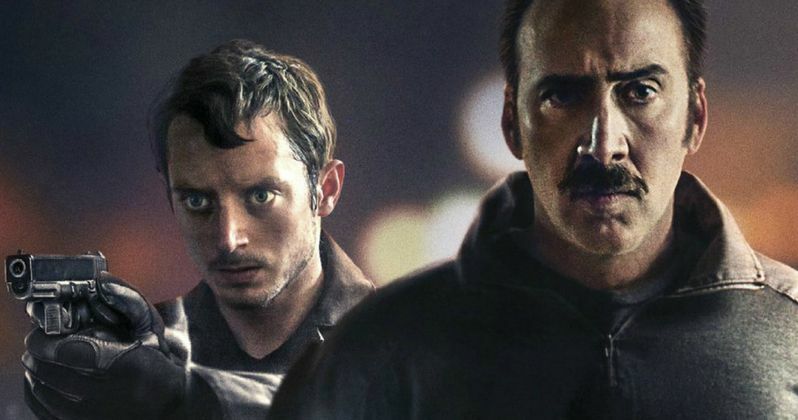 A pair of Las Vegas cops stumble onto the fortune of a lifetime in the first trailer for Saban Films' The Trust, starring Nicolas Cage and Elijah Wood. The dramatic comedy was picked up by Saban Films back in November 2014, and it will hold its world premiere at the South by Southwest Film Festival later this month. It will debut on April 14 for DirecTV subscribers, before arriving in theaters and on VOD platforms May 13. Waters (Elijah Wood) and Stone (Nicolas Cage) are two nobody police officers working dull administrative jobs and making extra money selling stolen Civil Service Exams to other officers. When Stone hears a story about a heroin dealer quickly beating his extremely high bail, the two friends set into motion a plan to find the origin of such a large amount of cash. Through diligent police work they follow a trail that leads directly to a custom bank-style vault built into the back room freezer of a small grocery store. They put a plan into motion to rob the vault and split whatever they find inside. But by the time they figure out what the vault contains, it's already too late to turn back. The supporting cast includes a rare performance from comedic legend Jerry Lewis, appearing in his first movie since 2013's Max Rose. Kevin Weisman, Jeff Howard and Sky Ferreira also co-star. Alex Brewer and Benjamin Brewer direct from a script co-written by Benjamin Brewer and Adam Hirsch. The movie marks Alex Brewer's directorial debut, but Benjamin Brewer made his debut with the 2011 film Beneath Contempt. Brad Schlei, Mike Nilon, Braxton Pope and Molly Hassell serve as producers. In addition to the trailer, we also have the first poster from The Trust, which you can check out below the new footage. The Trust will be going up against Money Monster, Free State of Jones, The Darkness and Kidnap when it hits theaters on May 13. Take a look at the first trailer below, and let us know what you think of The Trust.